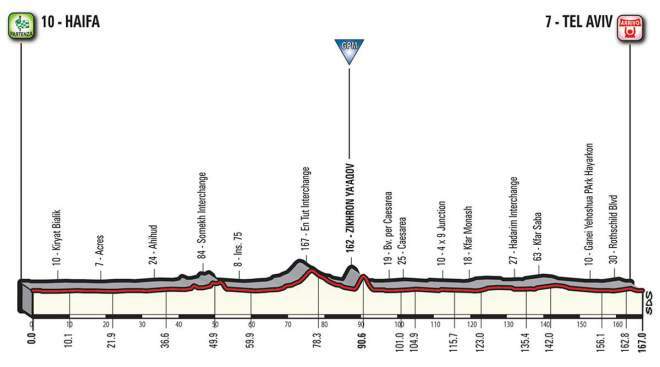 Mostly on wide, flat roads with just a few changes of direction, stage 2, a 167 km going from Haifa to Tel Aviv fits the pure sprinters. Half-way through, the only categorized climb in Zikhron Ya’aqov (a town founded in 1882 by Edmond Rothschild in memory of his father James-Yakob) at the top of a very steep short climb, the first gran premio della montagna (King of the Mountains – KOM equivalent of the Giro d’Italia) points will be delivered there. Very fast-running finish section across Tel Aviv and Jaffa.